If you aren't familiar with 100% Brett beers — and what exactly that means for flavor and character compared to a mixed-yeast, Brett-invaded beer — I'd ask you to kindly indulge me and read my explanation of all-Brett fermented beer. I'm trying to keep my long, rambling entries in check, so I don't want to spend a lot of time explaining how 100% Brett beers aren't actually as funky as if you let Brett "invade" a beer. But first, you should know that: 100% Brett beers aren't generally very funky. So, a funky, sour beer wasn't my goal here. My goal was something that more-or-less resembles a Belgian Golden Strong ale, a beer that might sneak into the hands of your average Chimay-drinking Belgian fan, but is actually deceptively experimental. A secret vehicle for Brett, a beer that may grow funkier and more unusual over-time, but doesn't have to. (My name for this one is Charlatan, because... well, that's what it's supposed to be.) I wanted to brew this to be stronger than most 100% Brett beers I've seen, because I felt this would give the Brett more to work with, and would also help to excuse the thin body 100% Brett beers are known for. (You already want a Belgian tripel or golden strong or whatever to be light and thin and drinkable.) A few other things I did: I brewed this to be very dry, by taking another page from Belgian tripels, using a significant portion of easily-fermentable sugars to bump up the alcohol without creating a rich, boozy fusel-fest — and of course, keeping the body of the beer light and dry. But rather than Belgian candi sugar, I went with local orange blossom honey, as I felt it would compliment the mild floral funk from the yeast, and add a suggestion of sweetness even after all the sugar had fermented out. I also threw in large percentage of acidulated malt, in the hopes that would contribute some baseline sourness to bolster the tart qualities of the beer. Lastly, I went with a mix of Brett strains: White Labs Brett L and Wyeast Brett B. More complexity? The result? Almost everything I described above. HIGH FIVES. I now, definitely think a beer of this strength is the perfect vehicle for an all-Brett fermentation. 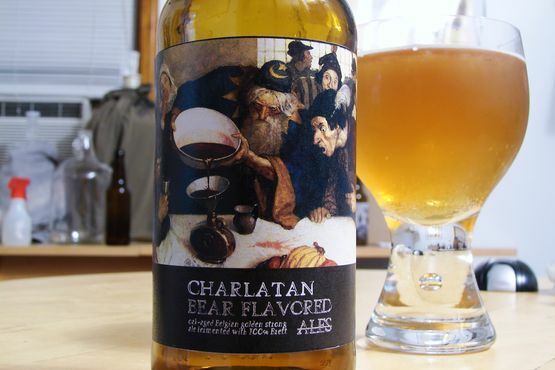 Other 100% Brett-beers of lower gravity often have a limp body and a somewhat odd, mealy mouthfeel, in my experience. This is partly because Brettanomyces doesn't create all of the same compounds that brewer's yeast does, and one of the missing compounds is responsible for our perception of 'body' in beer. But you just have to take steps to counter that, right? In a crisp, golden-hued 8.4 percenter, you don't want big and rich and syrupy. You want light and drinkable, a beer that seems simple at first, but hides many inner complexities. 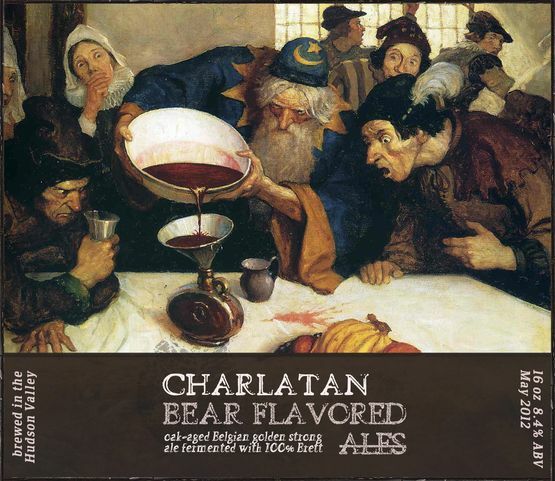 The flavor of Charlatan is hard to describe, and on the mild side, but very pleasant. This is so light, crisp and fruity, it seems closer to a cider than a beer. Between the oak-aging, the sweet honey finish, and the general tartness, this has a very distinct tart apple / cider flavor to it. "Cidery" can be an fermentation-produced off-flavor in beer sometimes, but that's not the case here. The flavor fits perfectly, a nice compliment to the notes of honey and dry, earthy tartness. There's a "sweet" honey flavor and some nice crispness from the oak as well, although I'm wondering if I should add even more oak next time. My first samples were oak-dominated, but the flavor has faded (or melded) considerably, to the point where it's not immediately obvious this beer was oak-aged at all. With a light-flavored beer like this, though, that's probably just fine. If there was any one, immediate change I'd love to make, it's that I wish this had some more funk. But that's no surprise. There's an earthy, fruity funk to Charlatan that's enjoyable, but not far from what you can get with some Belgian yeast. That classic Brett barnyard aroma is missing, and... I miss it. I was really optimistic about my strategy to unearth maximum funk from an all-Brett fermentation, but I might have to admit defeat in this regard. I added all that extra honey and sugar in stages, after primary fermentation had ended, for two reasons: to allow the Brett time to work on the large amounts of sugar in stages, to reduce 'hot' alcohol flavor, and secondly, in the hopes that Brett would produce more funk if it was chewing sugar over a longer period of time. The first part of the strategy worked brilliantly — there's almost no hint of booze in this, despite the ABV — but it didn't seem to give Brett any more motivation to fart out the good stuff. Even the 12.4% acid malt I added 45 minutes into the mash didn't add any noticeable sourness, although it's probably helping to accentuate Charlatan's tarter qualities. When I rebrew this, I'll hopefully have a few new strategies to bring out more funk — I think I'm going to experiment with aeration variations, at least — but ultimately, this beer doesn't need the extra funk. While it's not my favorite homebrew flavor-wise, I'd say there's nothing specifically flawed about it, and in fact there's nothing I would specifically 'correct' about it. The lack of funk isn't a failure — it's how most 100% Brett fermentations go. I know of very few commercial beers like this — the only beer I've had going for more-or-less the same thing is New Belgium and Lost Abbey's Brett Beer collaboration. That beer was maybe a bit more unusual but also too sweet for my tastes, and I'm going to say, with as much humility as possible, that I'd rather drink my own beer. Which is not to say that Charlatan couldn't be a better beer — I still will tweak it when I rebrew it, and probably tweak it again a few times after that. But since I don't have any specific corrections to make, I think this is already very, very close. If it wasn't for the fact that I saw this Label in the Label thread on HBT, a quick glance would have made me think you were reviewing another beer! AWESOME LABEL. As for the beer, do you think more "funk" will come with age? Haha that is awesome, thanks! I'm hoping so. It's already about five months old, but I'm definitely holding on to a sixpack or so for its one-year and two year anniversaries, at least. I haven't had the opportunity to try many aged 100% Brett beers, especially high ABV ones, so I really don't know what to expect. I'm also hoping that when I re-brew it next year I'll be able to bring out more funk from the get-go. I gotta ask, how long you fermented this for, I'm looking at something similar soon, and wondered if you fermented and bulok aged, then packaged? I believe I let this age for three or four months, but I could probably could have packaged earlier just based on terminal gravity. I gave it some time to sit on oak, all in primary, never transferred. Then bottled.